Want to enjoy your camcorder MOD video on computer or other player? 4Easysoft MOD to MPEG Converter provides the best solution to convert MOD video to MPEG format. Also this MOD to MPEG Converter can also convert MOD to MPG, AVI, VOB, etc. with best quality. For better enjoyment, you can edit the video before converting MOD to MPEG. It is easy for you to adjust video visual effect, trim video length, crop video frame, add video watermark and merge video segments together, etc. Convert MOD to MPEG, MPG, etc. 4Easysoft MOD to MPEG Converter has the professional ability to convert MOD and TOD video to MPEG and other video formats like MPG, AVI, VOB, etc. With this MOD to MPEG Converter, you can freely convert MOD to MPEG for various players supporting MPEG video like BlackBerry, PSP, Archos, Xbox, etc. The program helps you convert one input MOD video to different output formats with one time conversion. The MOD to MPEG Converter can help you optimize the MOD effect before converting to MPEG including brightness, contrast and saturation. With this special MOD to MPEG Converter, you can choose to convert part MOD video to MPEG video to remove the unwanted video part. This MOD to MPEG Converter enables you to crop the video screen to fit your player by adjust the aspect ratio. This software provides you the way to add text or image watermark to converted MPEG video. 4Easysoft MOD to MPEG Converter can help you join several MOD video together to output one MPEG video to enjoy on your player. 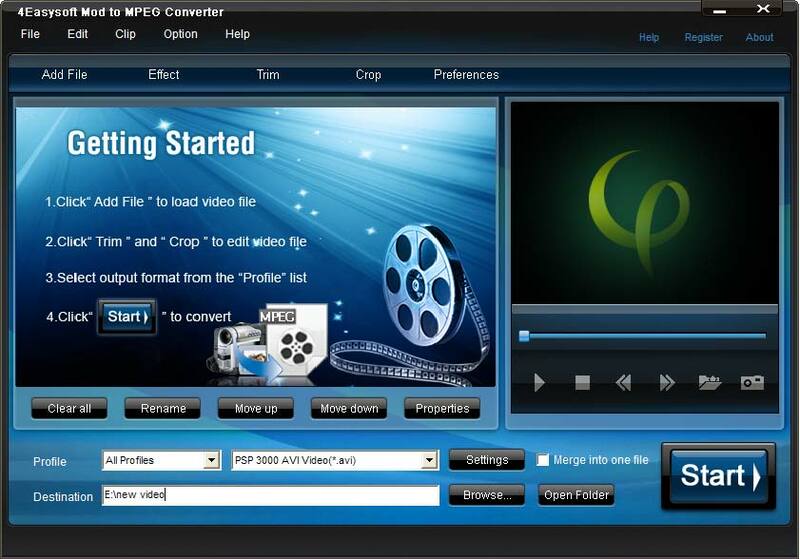 The MOD to MPEG Converter is designed with intuitive interface, which is convenient for your MOD to MPEG conversion. With the built-in player of 4Easysoft MOD to MPEG Converter, you can preview the source MOD video and converted MPEG video. Meanwhile, taking pictures of your favorite video scene is also available. 4Easysoft MOD to MPEG Converter has the advanced encoding and decoding technology, which can totally accelerate the MOD to MPEG converting speed along with the best output video quality. Convenient function to convert inputs to many files in different formats only one time. Support choosing subtitle and audio track.